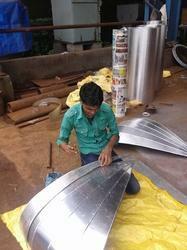 We are the leading service provider of Sheet Metal Fabrication Services. Being the market leader of this domain, we render highly effective Aluminum Sheet Cladding Fabrication. Their systematic execution and cost effectiveness make the aluminium sheet cladding fabrication services highly demanded as a jacketing insulation. The rendered aluminum sheet cladding fabrication services are rendered by us in user-defined specifications.